A Cardboard Problem: Who had 6 RBI in an ALDS Game? Ohhh Robbie Cano, Don't Ya Know?!!! I know you all don't need to hear me go on and on and on about Cano and how great he is, but I was on the train home last night and was diddling on my eBay app and noticed something (aside from the addiction to eBay that is). Prior to last night's game this card was at $61.00, and I know this for a fact because I got a notice on the train that I was outbid (yes, addict). While I was upset, it's really ok considering I don't have $60.00 to spend on that plus it would have never ended that low in my opinion. On the train ride home, more eBay monitoring showed that the card spiked to $80.80. This is what an RBI double (that probably should have been a homerun), a grand slam, and another RBI double will do to a cards value. My 2009 Topps Triple Threads Robbie Cano "Robbie" card (one of my favorite cards ever. Yet, this year we have this card that not only has his nickname misspelled, but looks horrible by comparison. (I tried to copy the image but I'm a spaz and couldn't figure it out.) Once I realized that I had the much nicer version of the card to begin with, it basically turned me off to chasing it right now. It has become one of those cards that when I get around to it or for the right price later I'll pick it up, not worth spending money on it as far as I'm concerned. 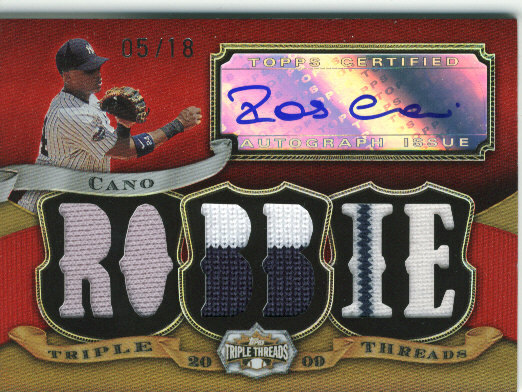 As a fan and a collector I am absolutely happy about Cano hitting and playing the way he has been even if it means possibly being out-priced on most autographs from here on out. I'll stick to the basic auto's and maybe try and snag some of the low serial numbered ones over the winter or beyond. Who is the guy that grounded out in a "hero" building situation that ended the game and gave me one of my best birthday presents ever - a Yankee playoff loss.